I have a new restaurant crush in Athlone, home of The Left Bank and Kin Khao Thai. The new place I've fallen for is The Corner House Bistro on Dublin Gate Street. 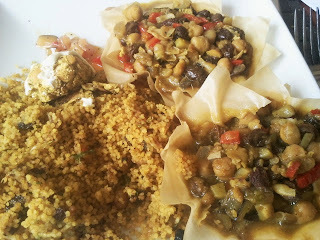 I had the chickpea samosas above and my husband had excellent falafels. I'm not sure how often the menu changes but I will be happy to go back and have the falafels all to myself. Their cakes looked equally fab so even tea and buns will do. The chef is formerly of the excellent Wineport Lodge so, really, how could you go wrong?